We have a web application, in which there is only 1 site collection with few subsites in it. 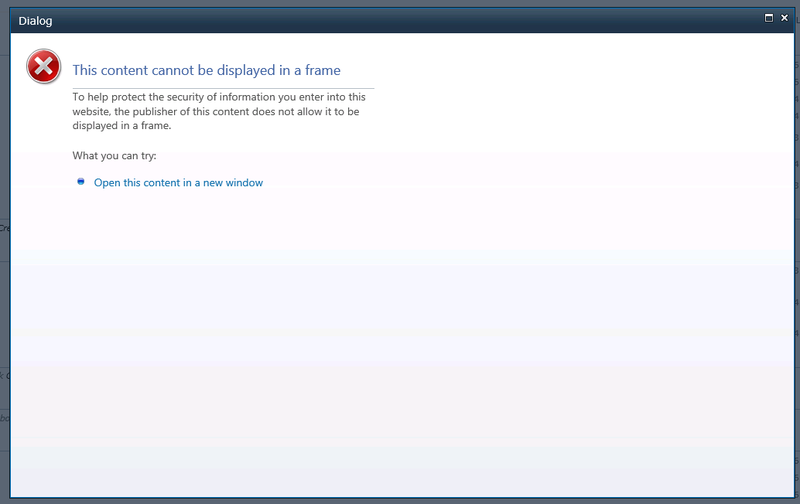 The problem is all the modal dialog forms when opened get error message(refer screen shot). Dialog forms such as check in, approve/reject a page, more options from site actions etc. There are solutions on the web like placing <WebPartPages:AllowFraming runat="server" />, but that can be used in SP 2013. Also other Web application in the farm works nicely. In what direction should I continue investigation? And has anyone come across similar issue. Alright I managed to solve the problem. If there is X-Frame-Options:Deny, Then just remove it or set value to "SAMEORIGIN". Removing X-Frame-Options worked wonders for me. Note: To know more about X-Frame-Options I recommend reading Combating ClickJacking With X-Frame-Options and Mitigating framesniffing with the X-Frame-Options header. Not the answer you're looking for? Browse other questions tagged 2010 modal-dialog iframe or ask your own question.